The husband and I have just returned from a two week exploration of Finland. Finland appeared to be a strange choice for many people when I told them where we were going – I was frequently met with confused expressions and comments such as “that’s random,” “why are you going there” and my favourite “you must be running out of places by now”. I have to admit I found these reactions somewhat difficult to respond to, and I think the reason for this is largely cultural. Being Australian, you generally don’t need a reason to go anywhere. The purpose is simple – to see what’s there, to explore – and to answer a question with a question albeit rhetorical – why not? But to give some background to our decision to go there, the husband and I had never really been to Scandinavia properly. Living on this island, one is fortunate to meet people from all over the world, and one of those turned out to be Finnish. She is quite proud of her homeland, and often spoke about its wonderful natural assets. The fact that she and her husband tend to travel in a similar way to the husband I meant that we trusted their recommendations and the deal was sealed. 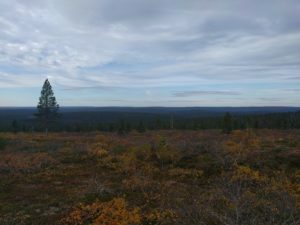 Two weeks in Finland, driving from Lapland all the way down to Helsinki – a basic itinerary was set. We started out in a small town above the Arctic Circle. I often find myself waxing lyrical about the ends of the earth – some of my favourite experiences have been staying in Iceland with its four hours of daylight in the middle of winter, or seeing the incredible light in the southern Chilean sky. Saariselka, in early September, too, is a stunner. Coming from a place far from such extremes, I was memerised by the midday sun – to me, it looked like it should’ve been 4pm, yet the clock said it was only 12. The afternoon hours, like the sunsets, lasted forever, and the sun, reflecting off the autumn yellows, gave everything a kind of golden hue. I’m sure it must become quite severe in winter, but in September, it was simply gorgeous. 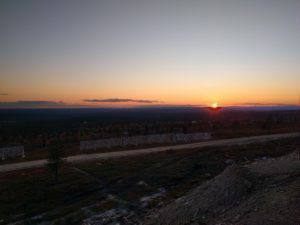 We went on to Ruka, a little ski resort town surrounded by national parks. There, we undertook one of my favourite hikes ever. The Small Bear (Pieni Karhunkierros) trail takes you through the forest, up past rivers, rapids and across little bridges. 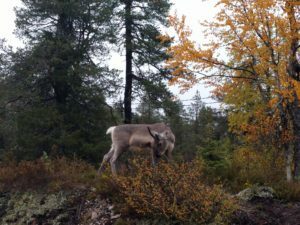 Through the autumn we met reindeer and only a small number of other hikers. 12 kilometres long, it wasn’t the most challenging trail, but it was the variation in scenery and the trail itself that made it so lovely and even relaxing. Driving further south, the forest continued; the vibrant green getting stronger as the weather slowly warmed. 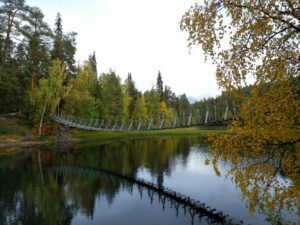 We found ourselves surrounded by more and more lakes, and in Koli we were treated to what I class as iconic Finnish scenery – the view of little pieces of land, green and fresh swimming amongst the cold blue of the water. I first saw such a view from the plane a few years back, as we flew into Helsinki airport on connection to Eastern Europe, and I was smitten with how clean, fresh and cool the place appeared. I was not wrong. Before leaving the wilderness, we were lucky to have a true Finnish experience staying at our friend’s cabin on the lake – with its own wood sauna (of course!). We spent time cooking on the outside fire, drinking beer and listening to the quiet. Too chilly to swim – but I can definitely picture myself back there during summer, jumping off the jetty. Throughout the entire trip, it struck us how comfortable the locals are with nature. Red and blue berries grow rampant for picking, as do mushrooms of all varieties (not being locals we weren’t confident to select any for our own consumption). On every trail there is a hut and a place for a campfire – everyone knows how to stoke a fire, cook food on it or boil a billy – even the kids. On one of our early hikes, we were sitting by the communal fire having lunch, when an older couple showed up, took out their little black kettle, and hung it on the fire to make coffee. No thermos required! We ended our stay in Helsinki – not a bad city, as far as cities go. It appeared to me a more concentrated, smaller version of Melbourne – likely encouraged by the presence of trams. If one leaves behind the port with its tourist markets and cruise ships, and wanders into the centre, there are many cool bars, funky restaurants and shopping strips to be found. And aren’t those the reasons we go to cities in the first place? If I could describe Finland in only a few words – fresh, natural, golden, green and quiet. I would encourage everyone to go check it out – but one of the lovely things about being there was the lack of tourists – most were locals. So, if you want to see it before it gets overrun…. I would suggest you go now. PS. We met the real Santa Claus. I have his picture to prove it.